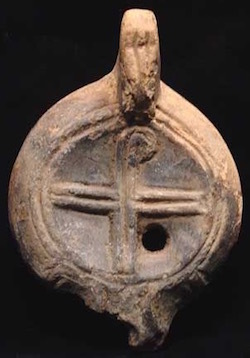 After the Edict of Milan in 313 AD, giving Christians the right to worship Christ, Christian symbols started to appear openly on many objects. 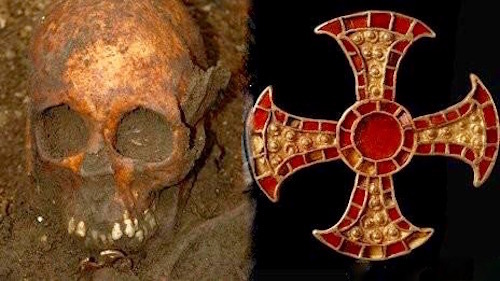 Until the Edict, Christians had worshipped in secret and displayed their symbols in the underground Catacombs. 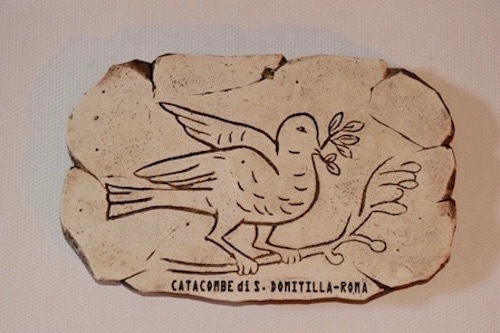 Catacombs of St. Domitilla, (c. 150-200 AD) a piece of marble with a very early depiction of the Cross blended into another symbol, the anchor. and flanked by two fish, also a Christian symbol, the Ichthus—three symbols in one Christian carving. 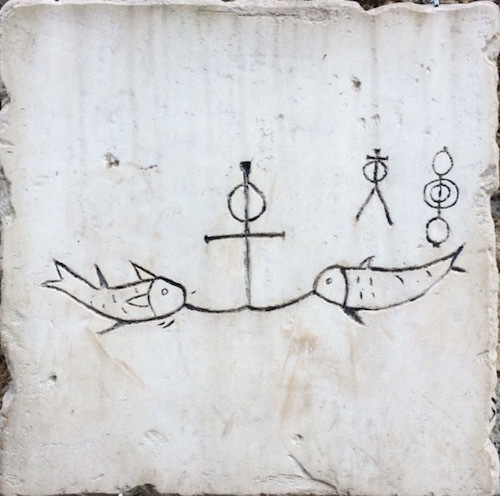 On this marble plaque (above) there is the further reference to Christ as Ichthus, the Big Fish and the symbol of Him as the Fisherman of men. 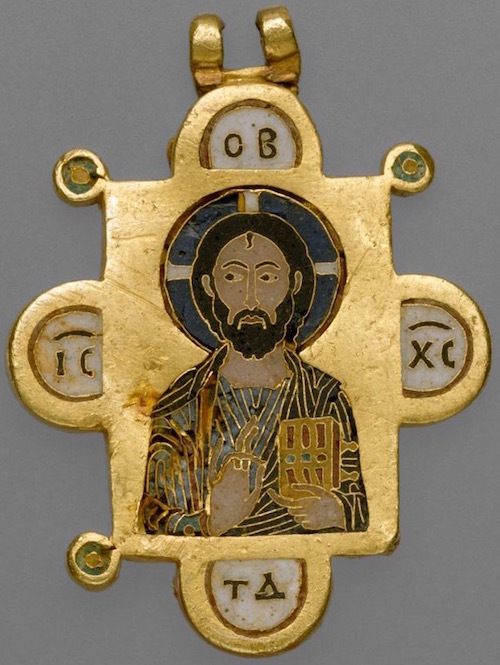 On either side of the Chi-Rho symbol above, the engraver wrote an (A) for Alpha and a (W) for Omega from Revelation 22:13: “I am Alpha and Omega, the beginning and the end, the first and the last.” The two letters were symbols of Christ as the Beginning and the End (as the first letter in Greek alphabet is Alpha and the last letter of the Greek alphabet is Omega). 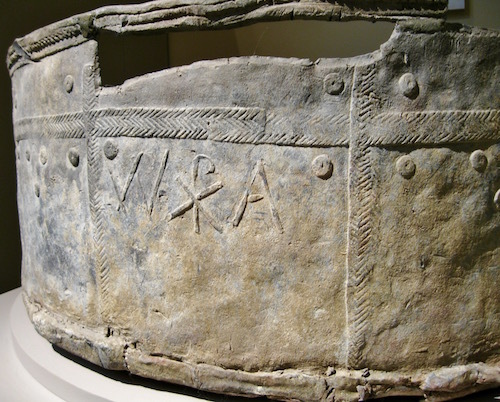 A very early Anglo-Saxon grave (c. 650 AD) was found near Cambridge, England (see below). It contained the skeleton of a teenage girl lying on a wooden bed. On her chest was a gold and garnet cross to symbolize she was a Christian. It is said in some ancient accounts and legends that Joseph of Arimathea (1st century AD) was the first person to bring the news of the Resurrected Christ to Britain. We know there were Christians in Scotland and Wales in the 500’s AD. Many claim England was Christianized by Augustine of Canterbury in 597. However, it could be that traders, merchants, soldiers had brought the Good News to Britain in the early centuries after the Resurrection. The staurogram is a monogram: “a motif made by overlapping or combining two or more letters or other graphemes to form one symbol.” The staurogram on the left is composed of two Greek letters superimposed over each other: the tau (written t) and the rho (written p). This staurogram morphs the Tau (as a cross) and the Rho (written P).